Here are 10 free websites to test internet speed. These internet speed test websites test download speed and upload speed of your internet. It helps you in ascertaining if you are getting same speed as your internet provider claims to be providing. All these internet speed test websites are completely free, and you do not need to download or install anything to use these. You do not even need to create an account or register to test your internet speed. SpeedTest.Net: SpeedTest.Net is one of the most popular internet speed test website. It quite accurately finds your internet speed. It also auto-detects your location, and does speed test from a server that is closest to your location. This gives you better accuracy of internet speed. You are also free to choose any other server to test speed of internet. It shows both download as well as upload speed. TestInternetSpeed: This is another simple to use website to find internet speed. It has a simple to use interface, and shows both Download speed as well as Upload test. VisualWare: This website provides most comprehensive information as compared to all the internet speed test websites listed here. Apart from download and upload speed, it also shows quality of internet connection, round trip time, a graph of the speed test, TCP delay, and more. However, I have listed it at number 3 because it does not automatically detects location, and you have to start by choosing your location from a map. SpeakEasy: SpeakEasy internet speed test is also quite easy to use, and shows both download as well as upload speed. However, you have to choose a server manually that is closest to your city. Also, it offers very limited number of server locations (only 8 at time of writing of this article). 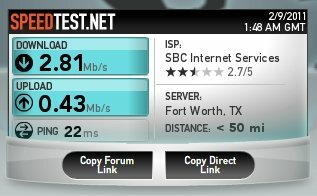 TestMySpeed: Like most of the speed test internet websites above, this also shows download and upload speed, and shows them in form of numbers. It does not asks to choose server location, so I am not sure if it automatically selects server that is closest to your location. However, its speed test result was in line with what other internet speed test websites displayed. So, I would assume it does selects closest server. BandWidthPlace: BandWidthPlace also shows both download speed and upload speed. It does not provides any other information, though. Still good for testing internet speed. WhatIsMyIP: WhatIsMyIP also provides a free internet speed test. It first prompts you to select a server, and then displays your internet speed. However, if offers only 6 server locations to choose from. InternetFrog: InternetFrog provides internet speed test that shows both upload as well as download speed. However, the upload speed that it displayed for my internet connection was way off what other websites reported (and was not at all in line with my expectations). I tried this test multiple times, and got the same wrong upload speed same time. CNET Speed Test: CNET also provides a basic testing for internet speed. However, it shows only download speed of internet, and not upload speed. McAfee Internet Speed Test: McAfee also provides a basic internet speed test. As is the case with CNet, it also shows just download speed. Tools like Ashampoo Internet Accelerator, and download manager help you get most out of your limited internet speed. To get accurate results from these websites, close all other browser windows, and do not perform tests on multiple websites at same time.